Uses titanium for the pins and outer plates, and special engineering plastic (matte white) for the inner links. Ideal for when the corrosion resistance of PC Series just isn't enough. Uses titanium for the pins and outer links, and special engineering plastic (matte white) for the inner links, for better corrosion resistance than PC Series (standard series). 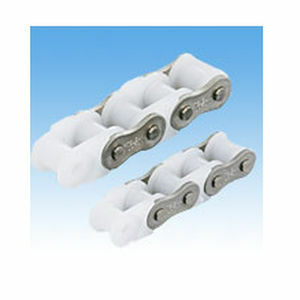 However, be advised when selecting that the maximum allowable load is 60% that of PC Series chain.